The Grand Trunk Western built this massive main line coal loader in the 20's or 30's between Lansing and Trowbridge (East Lansing). The facility was capable of loading fouor locomotives iimultaneously on four traacks. Loaded coal cars were brought under the portal at the left for loading into conveyers to take it to the massive bin above. This facility still exists today, though abandoned. 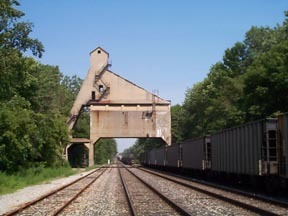 Two tracks still bring trains underneath and the side track is used for coal storage to a nearby municipal power plant.